BM Series fuse blocks are compatible with the Edison MCL, MEQ, MEN, and MOL and for use with any 13/32 x 1 1/2" fuses. 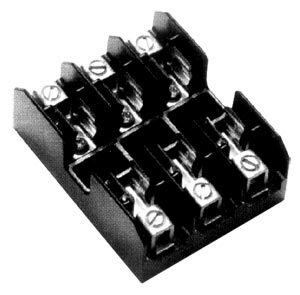 The R250 Series fuse blocks are compatible with Class R fuses, such as: Edison LENRK and ECNR. The FP-2 and FP-3 are tools to help easily remove fuses. FP-2 is for 13/32 to 13/16" diameter fuses. FP-3 is for 1 to 1 3/4" diameter fuses. 참고: SR is a Screw type, clip with reinforced spring, CR is a Box lug type, clip with reinforced spring.